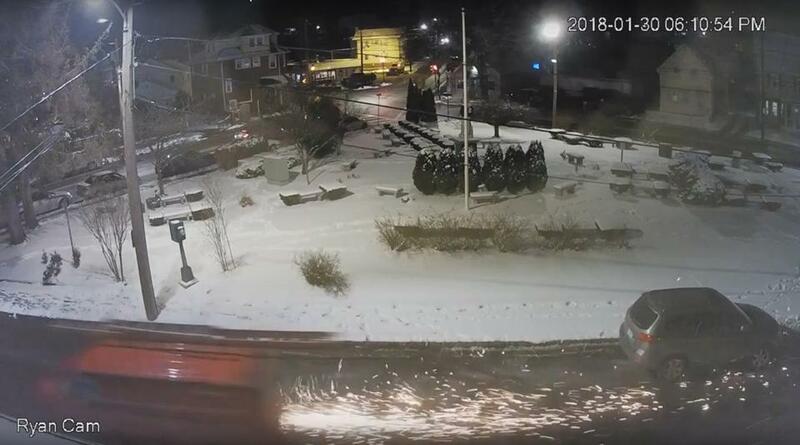 Sparks flew from a van being pursued by police Jan. 30 in this shot captured by a Quincy resident. Every day, police officers respond to reports of all sorts of events and nonevents, most of which never make the news. Here is a sampling of lesser-known — but no less noteworthy — incidents from police log books (a.k.a. blotters) in our suburbs. The sparks were flying, literally, during a police pursuit in Quincy Jan. 30. It all started around 6 p.m., according to police, when detectives saw what appeared to be a drug deal between a female passenger in a red Chevy van and a resident of Water Street. When the officers moved in, the police account continued, the van took off rapidly, its driver refusing to stop. Along the way, police said, it struck a vehicle on Copeland Street, blew a tire, and began “emitting large amounts of smoke and sparks were shooting from the wheel well.” (A resident captured this part of the chase on video, and tweeted out footage showing the van spewing sparks as it drove down West Street with police cruisers following close behind.) Other departments joined the pursuit as the van hopped onto Interstate 93, exited at Granite Avenue on the Milton/Dorchester line, and was ultimately stopped by State Police on Minot Street in Dorchester. Police recovered a crack pipe from the van and arrested its driver, a 50-year-old Hull man, on multiple charges. The passenger, a 38-year-old Quincy woman, was arrested on an outstanding warrant and charged with possession of a class B substance, knowingly resisting arrest, and being a disorderly person. If you’re not familiar with the term “Storrowed,” you undoubtedly know the reality it describes: trucks stuck underneath that notoriously low overpass on Storrow Drive. But you don’t need to be driving along the Charles to get that foolish trapped feeling. Case in point: Just after 4:30 p.m. Jan. 26, Winchester police were dispatched to a railroad bridge on Cross Street after a W.B. Masontruck tried to squeak through, but didn’t quite make it. An officer reported that the roof of box truck “had been completely peeled off” and there was debris on the roadway and sidewalk. The driver was uninjured, however, and was able to drive the truck — the back of which, at that point, looked like an open container — to his company’s parking lot inWoburn. According to police, it was hardly a rarity at the bridge: Despite bright yellow warning signs, such incidents there occur a few times a year. On Nov. 29, Watertown police and firefighters responded to the Target store at the Watertown Mall after an employee reported finding a suspicious device. That sounds like a fair description for what police found: a small black plastic box of unknown origin with two flashing lights. The State Police Bomb Squad was called in, and determined the device was harmless, just a battery pack with LED lights. The explosive growth in the popularity of ride-sharing services like Uber and Lyft has led to unexpected side effect for local police officers: They’re frequently sent to check on the well-being of such drivers conked out in their cars. From Dec. 2 to Dec. 10, for instance — a little over a week’s time — police in Saugus and Peabody were dispatched at least three times to check on the welfare of unmoving drivers in cars parked in store lots off Route 1 — in each case finding an Uber driver taking a nap. Those vast and anonymous parking lots may be prime rest areas, but exhaustion can strike anywhere, of course. At 6:40 a.m. Dec. 17, Dedham police checked on a person in a vehicle parked on High Street, who turned out to be an Uber driver “taking a break.” If it gets much worse, officers will be looking back with longing at the days when public drivers — snoozing and otherwise — could all be found at the local cab stand.